Occupy Comics: Art & Stories Inspired by Occupy Wall Street is a forthcoming comic book anthology featuring work created in response to the Occupy movement taking place at multiple sites around the world, most notably in New York City. Spearheaded by filmmaker Matt Pizzolo (Warren Ellis: Captured Ghosts, Godkiller), the project is intended to be "a time capsule of the passions and emotions driving the movement" and "tell the stories of the people who are out there putting themselves at risk for an idea." Featuring such popular creators as Charlie Adlard, Marc Andreyko, Tyler Crook, J.M. DeMatteis, Joshua Dysart, Joshua Hale Fialkov, Joseph Michael Linsner, Steve Niles, Steve Rolston, Tim Seeley, Ben Templesmith, Dan Goldman, Amanda Palmer and Darick Robertson, Occupy Comics has already received $10,000 in pledges via the Kickstarter fundraising platform. ComicsAlliance can confirm exclusively that Occupy Comics will also contain material by Mike Allred, Shannon Wheeler, Eric Drooker, Ryan Ottley, Dean Haspiel, Guy Denning and, perhaps most auspiciously, David Lloyd, whose work has already had a demonstrable influence on the Occupy movement, with many protesters wearing the Guy Fawkes mask he designed for his and Alan Moore's anarchist anti-hero in V for Vendetta. Occupy Comics is distinct from other comics-based Kickstarter campaigns in that it will pay its contributors from the funds raised, but those contributors have promised to "immediately" donate their wages to the protesters as they see fit, and before the final product is released. The plan requires some explanation, so with nine fundraising days remaining in the campaign, ComicsAlliance connected with Matt Pizzolo for a candid interview about the philosophy, goals and financial particulars of Occupy Comics, and to discuss the controversial protest movement that the book represents.Before we get to our conversation with Matt Pizzolo, it's important to understand the predicted life cycle of Occupy Comics. While some comics-based Kickstarters take the form of a single volume made available for retail, Occupy Comics has a more unique publishing plan. The ultimate form is a large hardcover volume, but Pizzolo will release single-issue comics as contributors begin to turn in their work. The first of these is expected next April or May in print and digitally, while the hardcover is tentatively scheduled for September of 2012. It's unknown just how many single issues will be released, as Pizzolo is still recruiting additional creators. As of this writing, Occupy Comics is not affiliated with an existing comic book publisher, Diamond Comic Distributors nor a digital provider. Rather, the single issues and hardcover will be printed and distributed independently and on-demand for those who've pledged an amount that entitles them to such copies: $5 for a digital comic, $15 for a printed single issue, and $50 for a hardcover book. At the moment, Pizzolo does not have plans to make the work available to the general public after the fundraising campaign has concluded. As such, anyone intrigued by the project should visit the Kickstarter page and investigate their options, as it's possible the book will be unavailable any other way. ComicsAlliance: Matt, your Kickstarter page suggests that the Occupy Comics project is to be a "time capsule" of the movement that has manifested in so many cities around the world. What does that mean with respect to the actual comics content? Will the contributions be "the story" of the Occupy movement in a biographical or autobiographical sense? Will there be fictions? 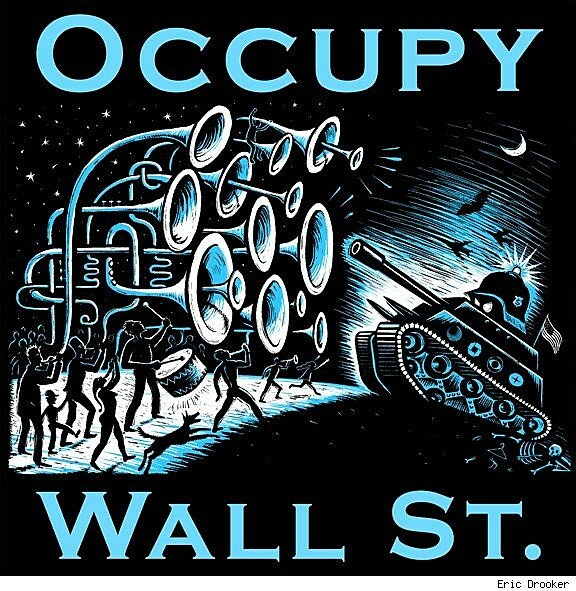 Matt Pizzolo: The book is called "Occupy Comics: Art & Stories Inspired by Occupy Wall Street." That means something different to every contributor. Some of the stories are specifically about the movement, some are only thematically linked to the broader issues surrounding the movement. 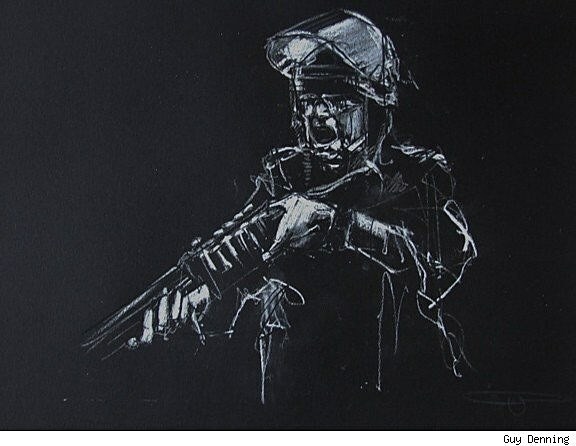 For example, Molly Crabapple lives a few blocks from Zuccotti Park [in New York City] and visited the park numerous times drawing portraits of the individual protesters. That's an extremely specific take on Occupy Wall Street. On the other hand, J.M. DeMatteis's piece is less directly linked to the actions in Zuccotti Park, his story is about the need for compassion in any social change movement and the importance of not vilifying either side. 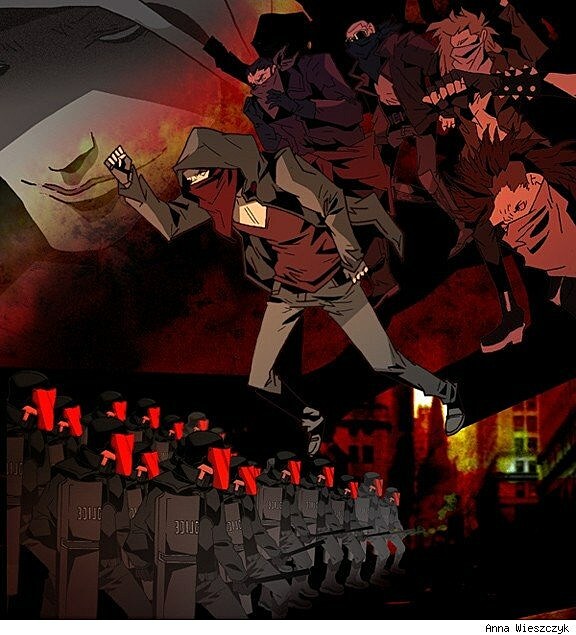 CA: Before you launched the Kickstarter campaign, you wrote on the initial OccupyComics.com site that Occupy Wall Street "needs art more than it needs a list of demands." The Kickstarter page makes reference to "creating change by creating art." I think a lot of people are curious to know more about this relationship between art and the Occupy movement, and why you think it's more important than specific policy platforms, which the movement has been criticized for allegedly lacking. MP: I think this is a social change movement, not a political movement. Social change movements are more about an innate sense of injustice, which is better expressed in art. I don't believe Occupy can win in the streets alone. It's easy to vilify cops but [JP Morgan Chase CEO] Jamie Dimon's not going to be caught pepper-spraying anybody. The movement has to operate on multiple levels. So the artistic component of Occupy Comics is just as important as the fundraising component. The street protests need to continue and retain their integrity, but the artistic articulation of the issues also needs to continue and grow. The movement has already changed the conversation in America, and that shouldn't be underestimated. I never in my life thought I would turn on a mainstream news show and see a serious discussion of class inequality and distribution of wealth in the US. But art is a key driver of all this, from inspiring the protesters to pervading the mindspace. It's more important that Occupy challenge our mindsets than it hold physical territory. This isn't Tahrir Square, it's not a physical battle to throw the bums out of office because we're complicit. At a certain level, we're all the bums -- all of us who have credit cards and 401(k)s and pensions, we're all invested in the system and we've all been enabling the rot at the top. So changing the national conversation is the most important part, and art and story play a critical role in that. CA: What do you hope Occupy Comics contributes to that conversation and that kind of change? MP: I think these comics can potentially help keep attention on more transcendent themes that drive deeper discussions and help nurture the gut sense that there is basic injustice here. I also think that the going can get tough and it'll be easy for protesters to get burnt out, so hopefully some of these stories inspired by the protests will also help inspire the protesters. CA: Is Occupy Comics meant to articulate the movement for those who are confused as to its purpose and goals? MP: Part of the experience for this project will be seeing how each individual interprets the movement. Some stories will help articulate personal feelings, others are more abstract, and still others depict some of the movement's purposes and goals through a variety of genres from slice-of-life to the fantastical. Comics are unique because a comic story is generally created by one or two people, so it's one of the most personalized, individualized forms of dramatic media. Occupy Comics currently has nearly 50 different writers and artists contributing to the book -- that's dozens of really personal takes on the movement. If a project is going to channel the Occupy sensibility through art it helps to include numerous points of view since the entire movement is a chorus of so many individual voices and perspectives. Without trying to define the movement and instead to simply express dozens of points of view related to the movement, the whole may be more transcendent than the sum of its parts. CA: Is Occupy Comics entirely supportive or will there be opposing voices as well? MP: By and large the book will include supportive voices, but there's no litmus test. If Frank Miller reached out to contribute we might not turn him away if he had something constructive to include, even if it was critical. CA: Let's talk more about creators. Perhaps most auspiciously, David Lloyd will be contributing to Occupy Comics. 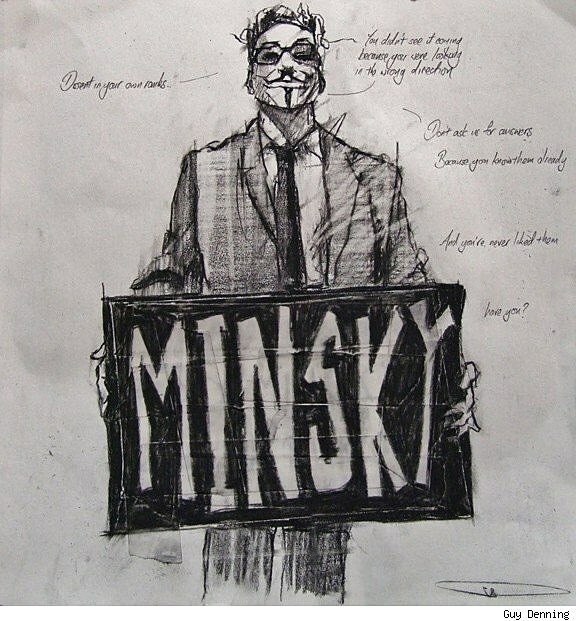 Having designed the Guy Fawkes-masked character V for V for Vendetta, the comic book that's inspired Anonymous and to some degree the Occupy movement, his participation is quite a big deal. What can you tell us about his work on the book? MP: It's amazing to have David Lloyd on board. Obviously his work inspired many of the protesters so there's something special about him participating in a project inspired by them. But this is really about the whole team coming together. Most recently Shannon Wheeler and Eric Drooker and before them Steve Niles and Molly Crabapple and Charlie Adlard and just so many talented people [joined the project]. I think David has discussed his feelings about the V for Vendetta symbol being used for various movements in your interview with him earlier this year. At this time, like all the other creators, he's continuing to work and be inspired. CA: What can you tell us about other specific contributors' work on the book? You've also got Darick Robertson, whose Transmetropolitan with Warren Ellis dealt with themes relevant to the Occupy movement. MP: Molly Crabapple has done portraits of individual protestors, David Mack and Amanda Palmer may collaborate on something, J.M. DeMatteis is working on a piece about the importance of compassion in any social change movement, Anna Wieszczyk is delving into sci-fi-punk radicalism, Brea Grant and Zane Grant are breaking out from traditional narrative and using charts and graphs for visual transitions into people's lives, and Darick Robertson said, "I'm contributing to this because I believe in the First Amendment." So we're very excited to see what the artists will turn in for the final book, and we're still in the process of confirming even more incredibly talented people. Overall, I'm just overjoyed about the people coming together for this. This isn't an easy thing to lend your name to especially for mainstream comics pros, it's a polarizing topic and I know several of the contributors are already getting grief for it. Some of the people I really thought would jump at this based on their body of work surprised me by declining and some who I never in a million years thought would consider it were inspired to take on the challenge. I personally have a reputation for integrating radical politics into art so it's a lot easier for me to take on a project like this than most people. It's really inspiring for me to see people cautiously come aboard this project because they really want to support the Occupy movement even if they feel it's potentially hazardous to their careers. That's way more important than somebody like me working on this. CA: Like Womanthology, you met your fundraising goal on the strength of the idea and the creators involved, with the comics sight unseen. Have creators submitted any kind of pitches or page layouts or other material for Occupy Comics that you can update the Kickstarter with, to show people what they would be getting for their bucks? MP: In some cases work is already complete, as many of the contributors have been drawing and writing over the last few weeks because they've been inspired by what's happening. In other cases, contributors are still working on or developing their contributions. We're looking to have material turned in so that we can begin publishing the single issues sometime in the spring of 2012. CA: I know people are curious about the fact that there will be single issues. It would seem that serializing Occupy Comics would introduce a lot of complications, especially with a goal of just $10,000 to be split between production and print runs of several issues and a hardcover and paying the contributors. In contrast, Womanthology is one book. Tony Harris' Roundeye for Love is one book. Alex de Campi's Ashes is one book, all with their own single release date. Why serialization? MP: Single issues give people a way to help fund the project without having to pay for the expense of a hardcover book. We wanted to have a tier that was affordable to people who want to donate less than $10 or $20. It's true that a portion of the funds raised will go to the production of the single issues and the hardcover book, but we want to keep those costs at a minimum, which is why we're not looking to do a larger print run for the general public right now. CA: Your presentation indicates that Occupy Comics contributors will be paid for their work and you have laid out a kind of scale for that based on the nature of their contributions, but the creators will be donating those payments immediately to the protests -- presumably before they turn anything in. If everyone is essentially working for free, why not donate those funds directly to the protesters after the work has been completed or (if you eventually decide to put it on sale for the general public) after profits come in? MP: There's a few answers to this. The reason to pay the contributors individually is because this is their work and they should be paid for it. The fact that they are participating in order to donate that money is fantastic but they should still decide how the money they generate is allocated. This is a collaboration but it's not necessarily a collective. The reason not to simply donate sales profits after the book(s) been published is mostly because comics aren't all that profitable in the first place, plus a book like this takes a long time to produce and even longer for revenue to trickle back in. So that makes it a weak model for fundraising a movement that needs support now. Many artists and writers want to support the protesters, but most are so busy just keeping their heads above water with their packed schedules that they can't even think about creating donation-based works until months from now, and if they're inspired to participate then this movement is important to them and they don't want to rush the creative process. It's fine for us to organize a time capsule of this amazing time in history, but our goal is to be more directly pro-active in supporting the movement as well. That's where Kickstarter fits in. With Kickstarter we can essentially pre-sell the comic and related merchandise before it's created in order to finance production. Kickstarter does not allow funds to be raised for charity, but that's fine -- we're using the funds to create the book (paying the writers and artists like any other Kickstarter comic), and then the writers and artists are donating their earnings. So we use Kickstarter's model to create new art and at the same time we enable the creators to support the protests. Basing the donation on profits would be speculative, basing the donation on page-rates is a slam-dunk. CA: Is there a mechanism in place to ensure the work that people pledge toward is completed even if the movement dissolves? MP: All of the contributors involved are dedicated professionals. Certainly unforeseen circumstances could cause someone to not be able to create a piece for the project, but we're counting on the goodwill, integrity, and respect of everyone involved to follow through. CA: How do you imagine the funds actually being transmitted to the protesters? Are there specific charities in mind, organizations set up to offer aid and other services to the protesters? Will donations be made in person and in cash? Do the recent evictions of the Occupy sites impact this dimension of the project? MP: The evictions impact the dimension of the project, sure, but this is a fluid, dynamic movement and we've been adapting to changes on the ground since the project was first conceived. The initial idea came pretty shortly after Occupy Wall Street began. During the early weeks, the movement was getting hardly any exposure beyond activist social media. I wanted to help spread the word about the movement and the upcoming New York Comic Con seemed like a great place to start since it draws around 100,000 fairly idealistic people. At that time, I was looking to do something lo-fi with a quick turnaround, essentially a 'zine about Occupy Wall Street featuring art and story by comics pros that would get attention at NYCC and maybe even drive some comics fans down to Zuccotti Park to see what it was all about. But before NYCC occurred, the now infamous video of NYPD Deputy Inspector Anthony Bologna pepper-spraying the two penned-in female protesters hit YouTube and everything went from media blackout to media circus, so exposure was no longer an issue. It was then that we re-envisioned Occupy Comics as a two-tiered project: a short-term fundraiser to support the occupiers with on-site amenities and a long-term artistic time-capsule to address the themes of the movement. So maybe now on-site amenities are less relevant. There are still occupied zones, but the movement is shifting. Well, we won't have the money for a month [per Kickstarter's policy], so the situation will likely change again before we can act. We're comfortable not knowing what lies ahead, but navigating as best we can. In terms of the actual donation transactions, that will vary as every contributor is ultimately in control of his/her share (though most will join shared efforts). The current plan is to offer several different pools of uses that contributors can opt into or out of, though they also reserve the right to just cash out and hand the money to their local protesters. Whenever possible, donations will be made directly in the form of amenities like heaters or honey wagons or possibly cash, rather than through establishment third parties. Some contributors may prefer to go through a not-for-profit for the tax deduction, but it seems most want to have more control over what the money specifically does. CA: As of this writing you've already exceeded your fundraising goal to the tune of about $1,100. What happens to excess funds? MP: Funds beyond the minimum will enable us to include more contributors and pay out more money that ultimately gets donated to the protesters. CA: What kind of response have you received so far from supporters in the comics and Occupy communities? MP: The response has been fantastic overall, though it's difficult for me to identify what community people are coming from and how much is specifically from the traditional comics audience. The song I used in the video is an Atari Teenage Riot song, and the singer Alec Empire posted on his Twitter about the Kickstarter. As a result, it was retweeted by the various official Occupy Wall Street, Anonymous, and Day of Rage twitters. So that was really unexpected and to be honest kind of nerve-wracking because I wasn't sure how they'd react. But they were all hugely supportive and appreciative. I think it didn't really penetrate the comics community until Frank Miller's blog went viral. That was huge, it sent a ton of pledgers to our Kickstarter and also sent a ton of comics pros our way who previously may not have wanted to put their necks on the line but felt the comics world shouldn't be represented solely by Miller's opinion. Plus, comics, maybe not traditional comics, but meme-based material that spreads around the web, even the piece you did with Pepper Spray Cop, I think helps spread the movement by mirroring the absurd. CA: What is your personal estimation of the Occupy movement? Why were you mobilized by the protests to create Occupy Comics? Have you participated in any protests personally? MP: I do have a background in activism, particularly the World Trade Organization/globalization protests of the late '90s. I was excited about the Occupy movement because it addresses many of the same themes as the globalization protests, but in the '90s it was more preventive whereas now it's reacting to a crisis. I think we as Americans tend to be better at reacting to crises than acting preventively. I've participated in both Occupy Wall Street and Occupy Los Angeles. The most interesting experience to me is the difference between participating in these protests versus the globalization protests 10 years ago. In the '90s, in order to participate in the protests one had to be brought in by an active protester who would train you in the tactics. Now, all of that is handled by Twitter. You don't need to know anyone and you don't need to get any hard information from anyone present on-site, all the information you need to know on the ground is transmitted to you in real time via Twitter. It was really incredible to experience. I was there for the first major face-off with Mayor Bloomberg when he was threatening to empty Zuccotti Park but backed off. The crowd cheered at once when it was confirmed that Bloomberg postponed the sweep, but the cheers weren't in response to anyone saying anything verbally... we just all read it on Twitter at the same time. That's a really powerful form of inclusiveness that's pretty new and has a lot to do with why the movement can grow so exponentially. 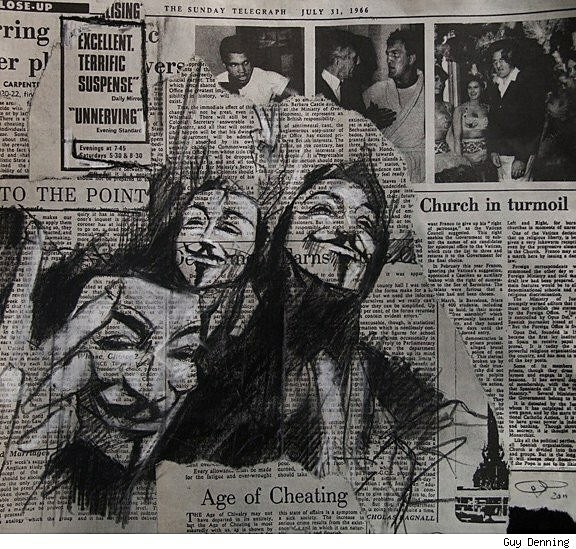 I think something really special about Occupy is that its backbone is art and technology. It's inspired by art and organized by technology, and both of those things are infinitely scalable. In its own small way, Occupy Comics mirrors that... creative artistic interpretations of the movement organized by use of a tech startup tool. I'm really excited about this model of marrying art and technology to raise money for social change movements. The Occupy Comics model could be a step toward a sustainable, arts-based, non-partisan means of financially supporting and protecting the movement. I guess the one thing I want people to really understand is that Occupy Comics isn't just supporting the protests, it is part of the protests. The arts are a theater of engagement in this movement, just as the streets are a theater of engagement and economic forums are a theater of engagement. It's not a street fight, it's a multi-platform effort to bring about a national paradigm shift.